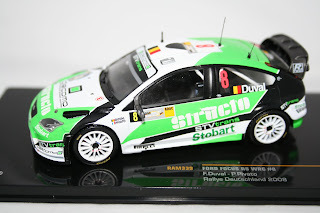 Hart Motorsport have just received the latest release of 1:43 scale Rally Cars by IXO. These models are some of the best IXO models we have ever seen with the detail higher than ever before. Listed below are the latest models released earlier this week. Each model has small differences with different sponsors and tyres etc. 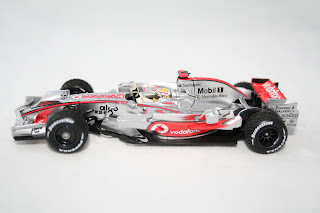 We also have a very small number of the car that Jenson won the Australian GP still in stock. Each model is available at £29.99 from our shop below. Just Arrived Hart Motorsport have just received the new Minichamps 1:43 scale Red Bull RB5 model driven to victory in the 2009 Chinese Grand Prix by S Vettel. 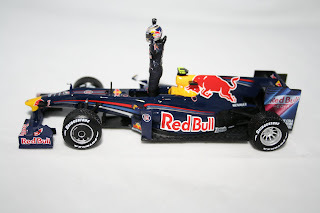 The model is the very first Red Bull car to win a grand prix and features rain tyres and a Vettel figure standing in the cockpit with arms raised. The model is a limited edition of only 6,192 produced and is available for only £29.99 from our shop below. 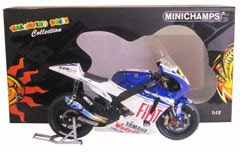 Hart Motorsport have just taken delivery of the brand new Minichamps 1:12 scale Yamaha YZR-M1 as ridden by Valentino Rossi in the 2008 Moto GP Championship. 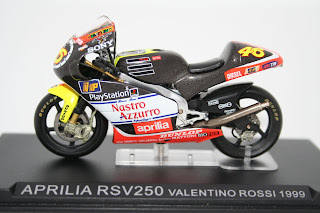 The last three Rossi models we have released have sold out within a week and we are expecting demand to be high for this stunning model as well. Available at £49.99 we believe this is one of the best prices around for the model. Please visit our shop below for full details plus 1000's more great models. Hart Motorsport are please to announce that Minichamps will be releasing two new Benetton F1 Car models. Due later this year will be a Benetton B189 Test Car driven by Mika Hakkinen in his first F1 drive. Also due later this year will be a Benetton B189B driven by Nelson Piquet at the 1990 USA Grand Prix. If you are looking to pre order either of these models please contact us below. For full details please visit our shop below. 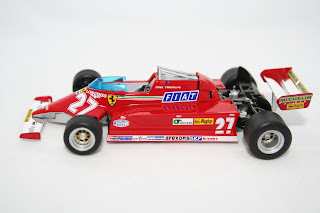 Hart Motorsport are please to announce that Hotwheels will be bringing out a collection of six different Ferrari F1 models driven by Gilles Villeneuve. Due throughout the year all six models will be 1:43 scale and built to a very high standard. We have just taken delivery for the Ferrari 126 CK model pictured above and are looking forward to the next release. For details on these models plus 100's more please visit our shop below. Hart Motorsport are please to announce the arrival of the 2008 McLaren F1 car that celebrates Lewis Hamilton clinching the 2008 F1 Drivers World Championship. Built by Minichamps this is the model from the Brazilian Grand Prix in which Lewis won the title on the very last corner. The model features rain tyres and has Lewis holding his hands in the air above the cockpit. The model come boxed in a Minichamps World Champions Collection box listing all the details on the car, points Hamilton scored in the season and lists all the Victories from that year. A simply stunning looking model. For details on this car plus 100's more Minichamps models please visit our shop below. 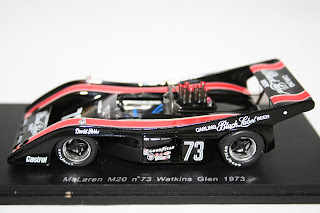 New in stock this week is the stunning Spark model of a McLaren M20 driven by David Hobbs at Watkins Glen in 1973. This model is build to the highest quality as has amazing engine and cockpit detail. Also new from Spark this week is the Tyrrell 007 as driven by Patrick Depailler and a Mazda MX-R01 Le Mans Car from 1992. We have also had a re stocks of the Shadow DN1 F1 Car as driven by Graham Hill in 1973. For details on these models plus all 100's more please visit our shop below.